In his sixth season at the helm of Ole Miss Cross-Country, head coach Ryan Vanhoy was named the SEC Coach of the Year on Wednesday. Freshman Cade Bethmann was also recognized by the conference, earning the SEC Freshman of the Year award. 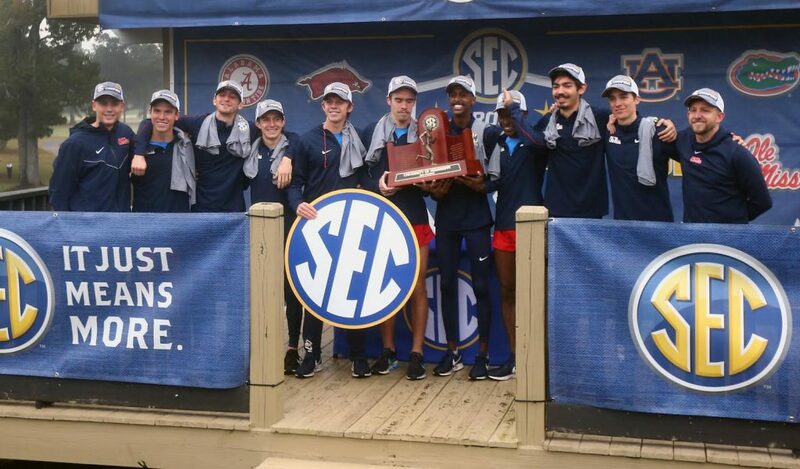 Vanhoy and Bethmann earned the awards after leading Ole Miss to its first-ever cross country or track conference championship, outlasting Arkansas 36-44 and snapping the Razorbacks’ eight-year run of dominance. In winning the SEC Championship, Ole Miss also broke through as the first team other than Arkansas or Alabama to win the cross country conference tournament since Tennessee in 1990. Vanhoy becomes the first Ole Miss men’s or women’s cross country head coach to win the award in school history, while Bethmann becomes the Rebels’ third recipient of the SEC Freshman of the Year award, joining Barnabas Kirui (2006) and Sean Tobin (2014). In addition to Vanhoy and Bethmann’s honors, Ole Miss had multiple runners named to All-SEC teams. Bethmann was named to the All-SEC First-Team, joined by Waleed Suliman and Mario Garcia Romo. Farah Abdulkarim and Mark Robertson made the second-team. Both Bethmann and Garcia Romo made the SEC All-Freshman team. Ole Miss Women’s Cross-Country was recognized as well, with Clio Ozanne-Jaques making the All-SEC Second Team and Lisa Vogelgesang making the All-Freshman squad. With the conference championship behind them, the Rebels are preparing for a road trip to Tallahassee for the NCAA South Regional this weekend, hosted by Florida State University.